It’s no secret that Midwesterners love food. While most of us eat a variety of cuisines (not just meat and potatoes! ), we still have a soft spot for the popular traditional dishes of the region. A lot of it has been influenced by Scandinavian and German heritage, and man is it delicious. But first, you may want to watch this video and learn how to pronounce (or how NOT to pronounce) the names of some of our food. Unless you live in the Midwest or have visited, chances are you don’t know what on earth ‘knoephla’ is… or how to pronounce it. Essentially, it’s the German version of a dumpling. It tastes similar to chicken and dumpling soup (but in our opinion, much better). You can buy knoephla by the bucket at Kroll’s… literally, they sell buckets to go. Kroll’s will come up time and again in this list for German dishes like kuchen and fleischkuechle (stay tuned for what the heck that is). Wurst Bier Hall always has the option of knoephla soup on the menu. Order it alone or as a side to some delicious bratwurst. You can occasionally find knoephla soup at the local lunch favorite, the Cracked Pepper as well. Eat under the iconic neon Hotel Donaldson sign in Downtown Fargo at the HoDo Lounge & Restaurant, with sweeping views of the main drag. Dine with an aerial view of Downtown Fargo in the Radisson’s Level 2 restaurant. You could go for the traditional bison burger patty, or skip it in favor of Lucky’s 13 Bison Beatballs (which are just a fancy name for meatballs). If you’re up for a fancier spot, Maxwell’s in West Fargo has a few Bison items on the menu – try the Bison meatballs or the braised Bison short rib egg rolls. This NDSU stomping ground is a pretty great place to get a bison burger, considering you’ll be sitting among “Bison” (aka NDSU students) while eating the school mascot at a place named after it. Right next to West Acres Mall, Urban 42 is a great place to try bison meatloaf if you want to try something other than a burger. Kuchen might be another foreign word to some. It’s a German dessert, a sort of combination of cake, pie, and custard. It has a crust and usually some type of fruit and custard filling. 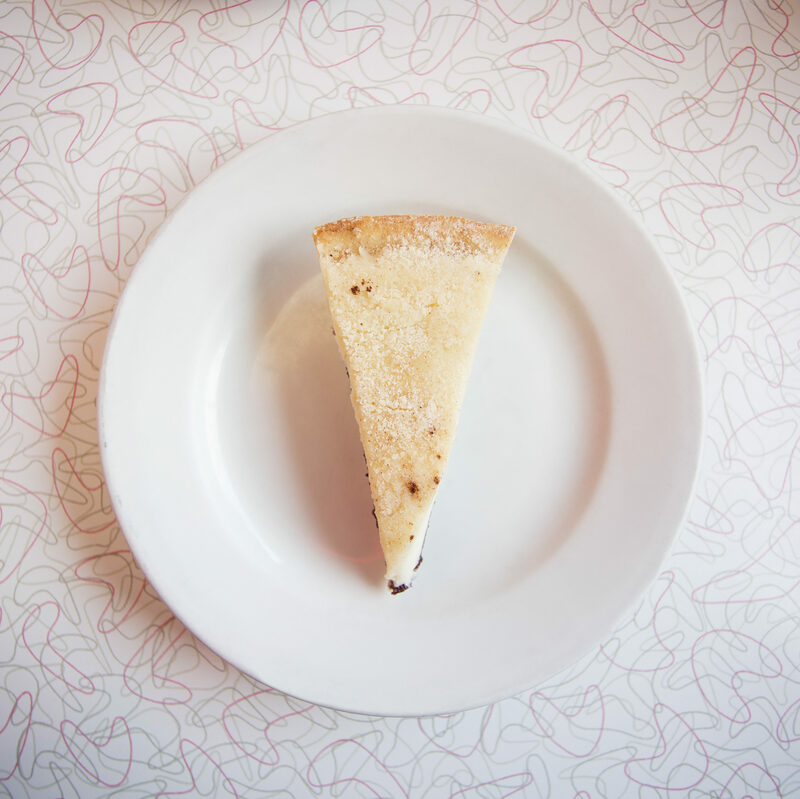 Get any local talking about it, and they’ll probably tell you how good their grandma’s or mom’s kuchen is and which type of fruit is their favorite kuchen addition. This is the 50s-style diner mentioned earlier that has the knoephla soup and some other German dishes. They offer a few different flavors of kuchen. Wurst Bier Hall serves kuchen to your preference (warm or chilled) and usually offers a couple different flavors as well. Anyway, hotdish comes in many varieties, sometimes depending on what you have in your cupboards and refrigerator. Everyone’s got their favorites, but if there’s one type of hotdish you should try, it’s Tater Tot Hotdish. Macaroni/Hamburger Hotdish (or goulash to some) is another favorite. Spellcheck will tell you it’s two, but don’t let it fool you: hotdish is one word. Cracked Pepper has a daily special and it’s often some type of hotdish — tater tot, chicken and rice, hamburger and potato, etc. From The Boiler Room appetizer menu, Three Cheese Tater Tot Hotdish is a very indulgent version of tater tot hotdish made with bacon, cheese and sausage gravy. If you’re craving a hamburger and hotdish at the same time, Sickies Garage has the perfect solution… the Tater Tot Hotdish burger. If you’re craving pizza and hotdish, Ole & Lena’s Pizzeria has the perfect solution… Lena’s Hotdish Pizza (pictured below). Another pizza place that has combined two of our favorite things, hotdish and pizza, is Rhombus Guys. 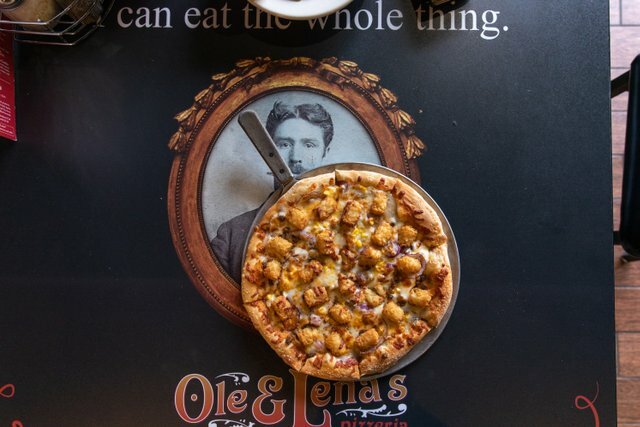 Their Tater-Tot pizza comes with jalapenos on it, so if you’re a true Norwegian (or just someone that doesn’t appreciate spicy food), you may need to prepare yourself or order the pizza sans peppers. Lefse is a Scandinavian sweet tortilla made from potatoes. Spread some butter on it, sprinkle it with sugar (white or brown), roll it up and enjoy! The best lefse is the stuff fresh off the griddle at grandma and grandpa’s house, but here are a few places in the Fargo-Moorhead area that are very good at making lefse. The lefse from the Sons of Norway is as traditional as it comes. You can stop in to purchase lefse and they also serve lunch 11:00am-1:30pm. Occassionally they will do other special dinners too and sometimes they feature lutefisk, another Norwegian tradition and delicacy. Freddy’s has been in the business of making lefse since 1946 so it’s safe to say they’re experts. You can purchase Freddy’s lefse by stopping in their store in West Fargo. It can also be found at many grocery stores in the Fargo-Moorhead area. Located in nearby Hawley, MN, Carl’s Lefse also gets rave reviews for having lefse that’s almost as good as grandma’s. You can stop by their Hawley shop or call to have some shipped to you. This warm soup actually hails from Russia and Eastern Europe. Why is it in North Dakota? Many Germans actually immigrated to Russia before moving to the good ol’ Great Plains, and they brought some of the food with them. The distinct red color comes from one of the main ingredients — beets! Pro tip: This is best with a bit of fresh whipping cream poured in. On the soup menu at Wurst, you’ll find borscht alongside the knoephla mentioned earlier. Another Russian dish that traveled with immigrants to North Dakota is fleischkuechle (or just “fleisch” for short). Perhaps the hardest of all local foods to spell and pronounce, don’t let that stop you from tasting this delicious food, which is a type of seasoned meat patty surrounded with fried dough. Most locals we know dip them in ketchup, so feel free to try that, too. Kroll’s strikes again with their wide repertoire of local foods. You could get knoephla as an appetizer, fleisch for your main, and then kuchen for dessert… whatta meal. Once you’ve gotten a taste of this Midwestern food and decided it’s actually quite good, you may want to check out our video series on How To Eat Like A Midwesterner, where you’ll find tutorials on how to make some of these Midwestern favorites.